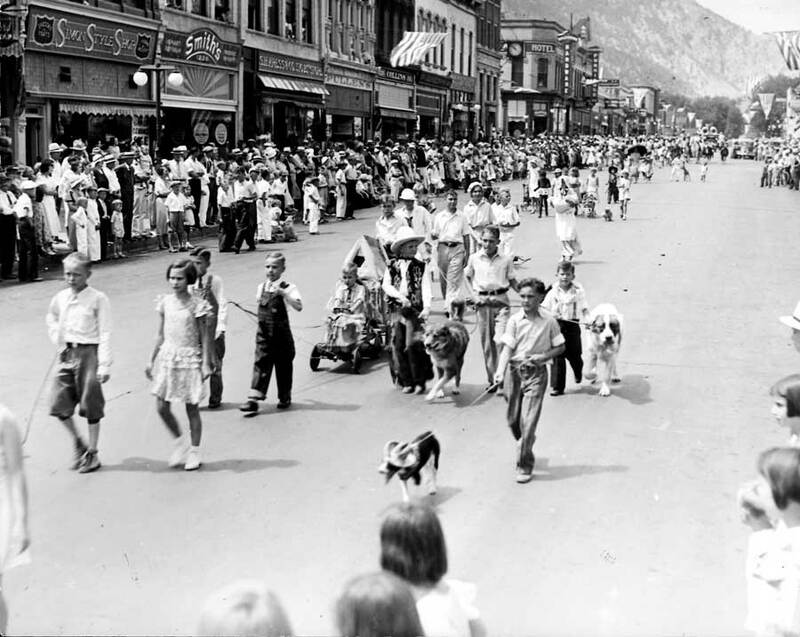 In 1934, Boulder civic leaders brainstormed an idea to help pull community spirits—and the local economy—out of the Great Depression. Unlike the traditional Native American gatherings known as powwows, this “Miners’ and Farmers’ Jubilee” had much to do with the West but little to do with Indians. 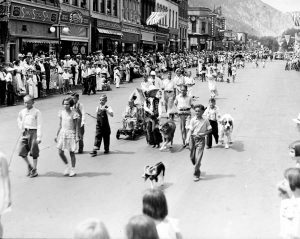 The Boulder Junior and Senior Chambers of Commerce and the Boulder County Metal Mining Association held the first “Pay Dirt Pow Wow” on Aug. 1, 1934—Colorado Day, commemorating the territory’s Aug. 1, 1876, admission to the United States. It began at 10:30 a.m. with the Grand Opening Parade, led on horseback by Mayor Howard H. Heuston and attended by at least 285 other mounted folks and a flotilla of homemade floats. 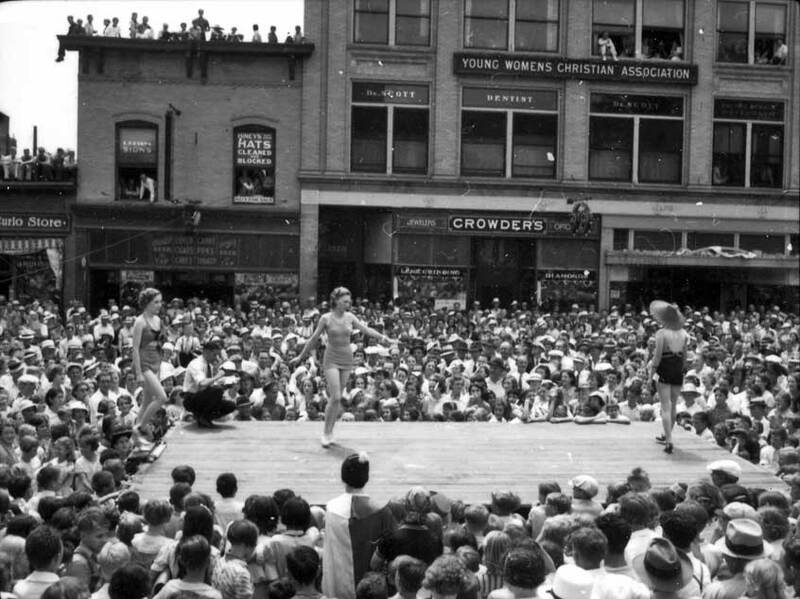 Next, domestic critters competed on the courthouse grounds, with owners winning prizes of $12 cash and six tickets to the Curran Theatre, now the Boulder Theater. Elsewhere on downtown streets, the Lafayette Volunteer Fire Department put on an exhibition fire-team drill and demonstrated the speed of its hose-coupling prowess. No less exciting was the tug-of-war event between 12-man teams, miners vs. farmers. The afternoon program, billed as “country fair-style,” started at 1 p.m. at the University Stadium, and entertained with a combination of variety acts (live music, acrobats, dancers, clowns and a “girl contortionist”), “stunts” such as greased-pole climbing, games from horseshoe pitching to softball, and a bicycle race of 24 laps. By 4:30, the Longmont All-Stars vs. Boulder All-Stars took to the softball diamond. A brief rain sent about 1,400 fans running to shelter, reported the Daily Camera the next day, “but a large percentage of them returned.” The Elks’ Cowboy Band of Longmont, “Prizewinner of the Kansas City Convention,” played to anyone left in the stands from 6:30 to 7 p.m.
By that time, the stands had swelled with 3,000 onlookers, all there to cheer human jack-hammers sweating under floodlights in the Colorado Championship Rock Drilling Contest. The contestants’ objective was to use hand drills to penetrate as many inches as possible into slabs of Jamestown Tombstone Granite within a set time. 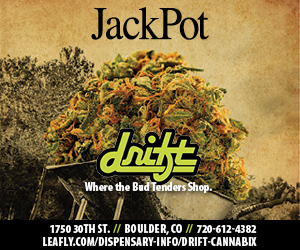 Prizes ran upward from $25 for “singlejack” (one-man) entries, and from $40 up for “doublejack” (two-man) teams. Boys had their own division. The audience also got to see a demonstration of a mechanical air-compressor drill. By 7:30 p.m., a carnival with 15 “games and devices of all kinds” took over the University Men’s Gymnasium. The whole shebang was topped by a dance at the same location from 9 p.m. to 1 a.m., with music by Glen Gordon’s Trail Blazers, highlighted by prizes awarded to the winners of the Whisker-Growing Contest. The Pay Dirt Pow Wow was a huge hit socially. Receipts made up about 60 percent of expenses, with “pledges” from merchants and other contributors expected to make up the rest. Over the years, this new annual civic celebration expanded to three and four days, with schedule and entertainment frequently tweaked. The popularity of the Miners’-Farmers’ Picnic and the championship rock-drilling event faded with time. But the opening parade bloomed yearly with vintage and specialty vehicles, homemade floats representing local clubs and causes, marching bands from far and near, and ever more mounted riders. By 1939, a horse show and Boulder’s first rodeo since a one-off event in 1927 had become regular features. The “bathing girls water fight” [with fire hoses] bowed out to “Pow Wow Royalty,” a young horse-riding “queen” and her “lady-in-waiting.” “Pay Dirt” was dropped from the Pow Wow title. Sponsorships morphed too, merging into a separate Pow Wow Association. Promoters poured it on with a mixture of community spirit and commercial ingenuity, keeping up annual pledge drives to support the event. Merchants soon competed with one other for the best Pow Wow­—themed store display windows, with photos highlighted in the Daily Camera. In the days leading up to and during the Pow Wow, local residents were encouraged to dress up in cowboy or mining regalia. Those who didn’t at least nod to the sartorial theme could be pounced on by a kind of Pow Wow posse and escorted to a “corral” at the courthouse. There they would be offered the choice of buying some item of wearable regalia or getting dunked in the courthouse fountain. 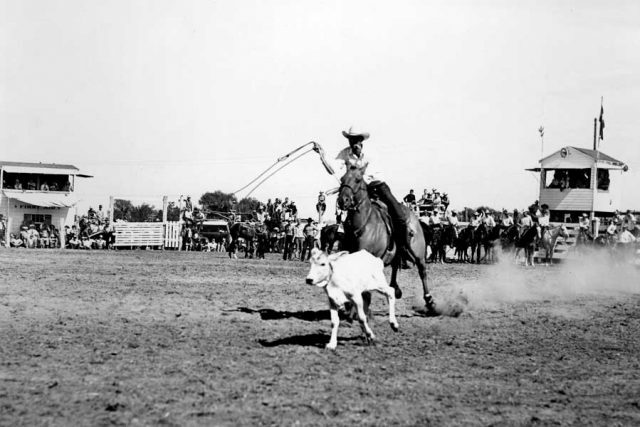 The rodeo grew rapidly to a stand-alone event that rivaled the parade for most popular entertainment, thanks to rancher Roland “Rollie” J. Leonard. 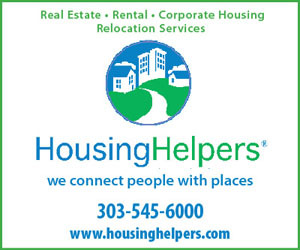 He provided land from about what is now 28th Street and Mapleton Avenue to 30th and Pearl streets, where the original downtown train depot had been moved. A barn-like indoor arena, later named for Leonard, came to be known as one of the best venues on the rodeo circuit. 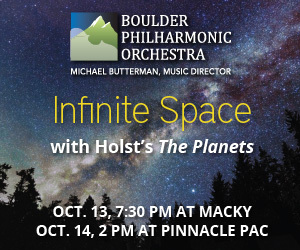 As Boulder grew, the once-dominant remnants of the 19th and early 20th centuries faded. Mining played out, family farms became subdivisions, and longtime ranches dwindled. 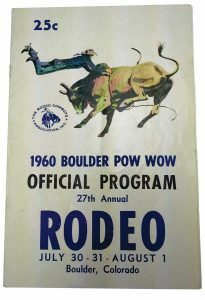 The Pow Wow Association was in tax arrears by 1957 and sold some acres of rodeo land to the city of Boulder. The parcel turned into baseball fields and a new site for the YMCA. With urban development lurking in the wings, the Pow Wow Association refused the city’s offer to swap rodeo land for a site near Boulder Reservoir. 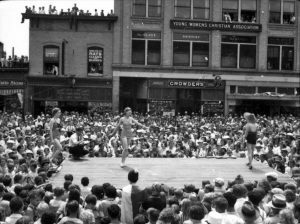 The entire event finally moved to Louisville in 1981 as the Boulder Valley Pow Wow, but community support faded. 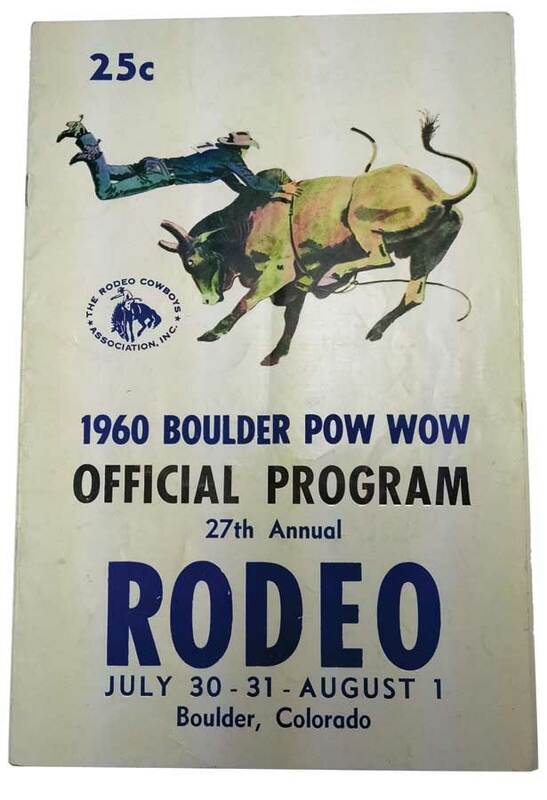 On June 6-8, 1986, the popular Little Britches Rodeo for kids became the last Pow Wow event, and the last of Boulder Valley’s big civic celebrations of Western traditions. 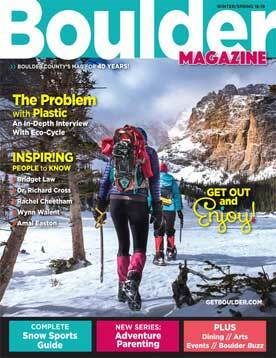 Charmaine Ortega Getz, author of Weird Colorado: Your Travel Guide to Colorado’s Local Legends and Best Kept Secrets, is also business manager for Rocky Mountain Revels, which produces the annual Christmas Revels held at Dairy Arts Center.